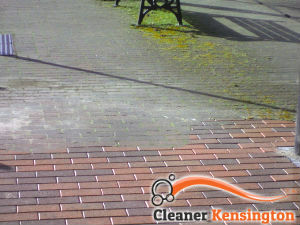 You are wondering how to bring your darkened brick fence or stained driveway back to life? To us this is nothing but a piece of cake as we specialise in providing professional jet washing services to customers in Kensington, W8 and the surrounding areas that come second to none. We use professional equipment, while each member of our team has been specially trained to operate the machines in a safe and effective manner. In addition, our services are available at all times so it matters not whether you call us on Sundays or on bank holidays – we are always at customers’ disposal! Don’t bother attempting to remove accumulated grime, stains and moss from your paved areas – we don’t mean to sound negative, but you will most likely fail. Our expert team of technicians are armed with the latest jet washers and high-performance pressure steam machines to ensure effective removal of all types of dirt and overgrowth from your patio, driveway, decking and brick fences. We will get the job done in no time and at very affordable rates too! When the team arrives on your doorstep, they will first evaluate the individual needs of your exterior paved areas to determine the condition of your property. This will enable them to avoid damages to your fence or decking. The service entails a final inspection of results in which you, too, are included! Don’t waste your time and efforts in futile attempts to restore the colour of your deck or brick fence. 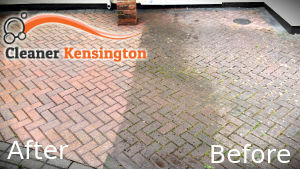 Entrust the true professionals with the job by booking our premium jet washing services in Kensington. We can guarantee you will soon become one of our numerous satisfied customers. Call us today to book an appointment and get your free quote!